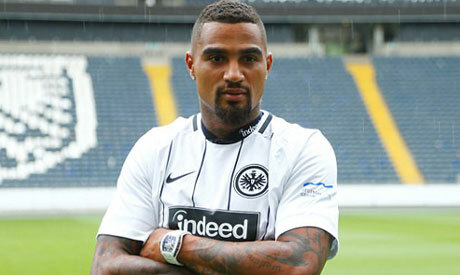 Kevin-Prince Boateng returned to his hometown club and scored for Eintracht Frankfurt to beat Hertha Berlin 2-1 in the Bundesliga on Sunday. Boateng, who grew up in the Berlin locality of Wedding and joined Hertha as a youth, let fly with his left boot to send the ball inside the top left corner with 10 minutes remaining. The 30-year-old did not celebrate the goal out of respect for his former club, for which he played 42 league games before leaving for Tottenham in 2007. Davie Selke had fired Hertha into an early lead, but Marius Wolf equalized around 10 minutes later after some lackluster defending. Fabian Lustenberger struck the crossbar for Hertha in the final minutes. Frankfurt climbed to eighth while Hertha stayed 11th after its fifth defeat. Borussia Moenchengladbach had the chance to go second later Sunday with a win at Wolfsburg.